SPRA Golf Day gets big thumbs up! SPRA Golf Day 2018 was held at Forest Pines Golf and Conference centre in Brigg. What a wonderful welcome they gave us! The facilities, staff and food were excellent, although the weather was a bit grey on the day. For the first time ever I am proud to report there was a ladies team, and I can also report that feedback from all was excellent, so thank you to all members who attended and brought guests. Dave Edwards entertained us all again with his trick shot show, but the highlight was his video of the golfers during the day, and his excellent and humorous commentary! 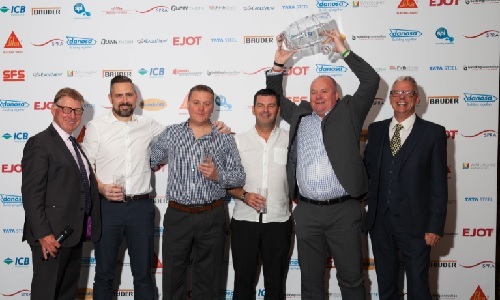 Congratulations to all the winners ( I thought Kevin Rackley from Ejot might drop the SPRA team trophy in his excitement on winning it for a fourth time 😊) Members can download pictures from the day from the members area of the website. Photos will be available to view next week. We will also be making the David Edwards video available when we have it, and are putting together another video from the drone footage that was kindly done by Danosa on the day. Look out for notices in future SPRA news! Finally, thanks again to Kate and Chris from Crescendo for another fabulous event.